It has been a few years since any of our kids had a birthday party, and since our son, Angelo, has been doing extremely well in school and the rest of his extracurricular activities (karate/jiu-jitsu, baseball, breakdancing class and gymnastics), we decided to throw him a BIG birthday party this year. 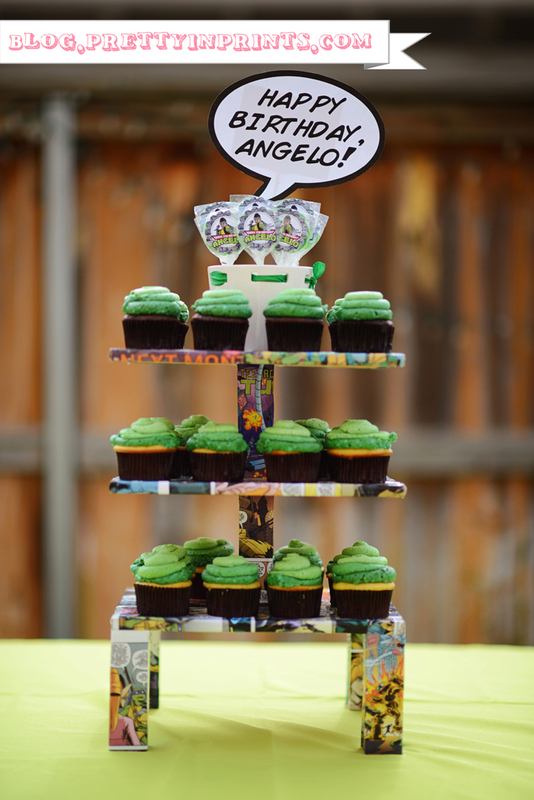 He picked out his party theme – Teenage Mutant Ninja Turtles, and then the research and ideas began to flow. The first thing I did was create his invitation. 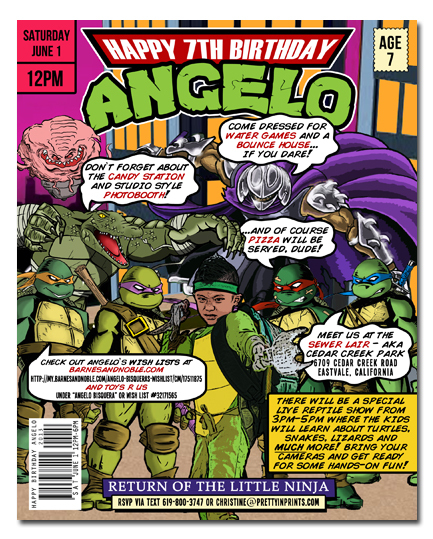 I decided to do a comic book ninja turtle theme for the invitation (which I probably should have stuck with throughout the rest of the party..but I didn’t). Here’s what I came up with…seriously my most favorite boy themed invitation to date! Of course we had to have a sweet treat station! Filled with Kraang’s Brain Blasters (strawberry puffs), Leonardo’s Katanas (green apple & pina colada twists), Bebop’s Chocolate Chip Taffy, Donatello’s Mini Chocolate Smoke Bombs (chocolate sixlets), Raphael’s Chigiriki Balls (gumballs), Splinter’s Green Apple Walking Sticks (hard candy sticks), and Rocksteady’s Coke Bottle Gummies. I printed cutouts of the comic book thought bubbles with different phrases on them and attached them to barbeque skewers so I could stick them in the candy jars. I decided to just do green ombre cupcakes instead of an extravagant cake since cupcakes are just so much easier to do. My husband helped make the cupcake stands and the stands that were used to hold the fruit cups. We went to the comic book store and decoupaged the stands with the comic book pages. We only used 1 medium container of Mod Podge (purchased with a coupon at Michael’s for $7), and $12 in scrap wood from Home Depot to make all 4 stands. 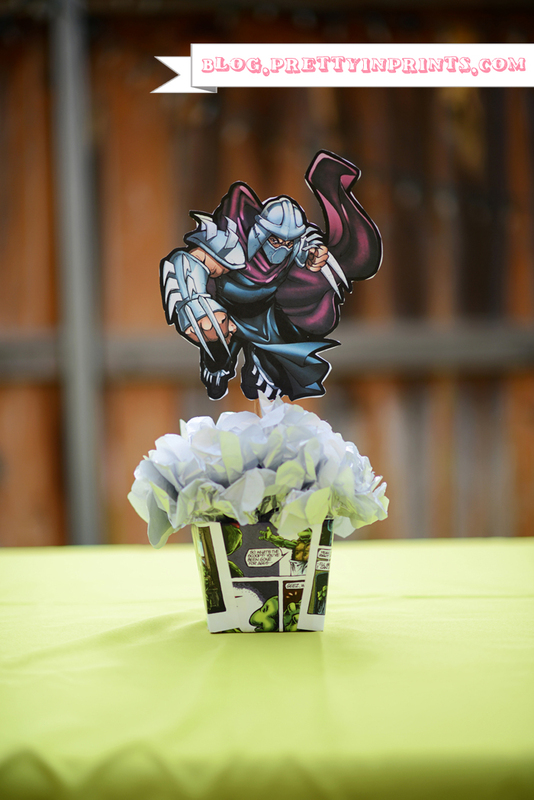 For the centerpieces, I printed 2-sided cutouts of characters (Shredder, Kraang, Bebop, Leatherhead, Rocksteady, Casey Jones and Splinter), adhered them to wooden dowels, and stuck them in boxes that I hot glued foam in the center of so the dowels would stay in place. The boxes were paper treat boxes I had purchased a long time ago on clearance for $0.50/each (I like to buy things in large quantities when they’re really cheap..I’ve used those boxes to hold favors for class holiday parties, etc). I took pieces of the comic book pages and just taped them around the box, looked up a tutorial for tissue paper pom-poms and stuck the pom-poms in the box to cover the foam. Took a little bit of time, but it was so inexpensive to make which was totally worth it! Let’s not forget the refreshments! 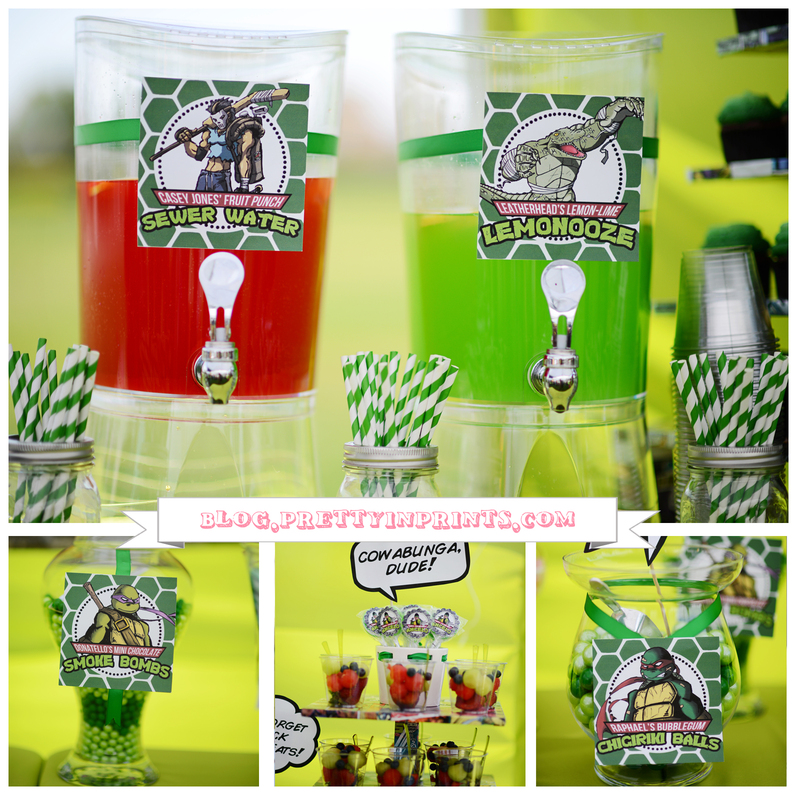 Casey Jones’ Sewer Water and Leatherhead’s Lemon-Lime Lemonooze were a hit at the party. 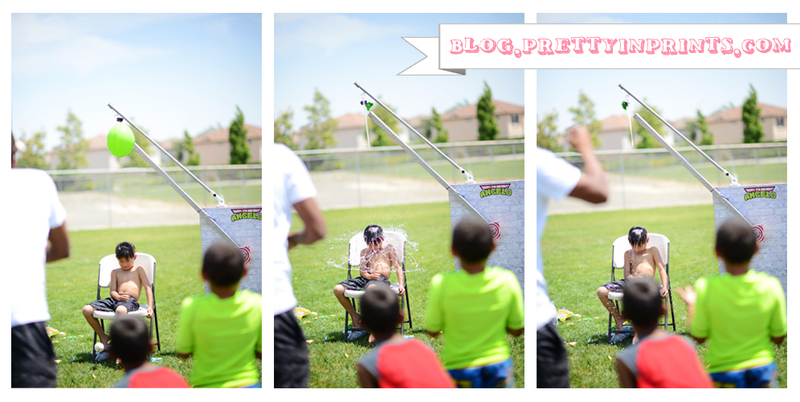 For the activities, in addition to a bounce house and the water play area, my hubby made a DIY Pitch Burst game where you have a balloon filled with water, and someone throws a ball to hit the target to burst the water balloon. All of the kids had a BLAST with this game. You can’t have a birthday party without a pinata! 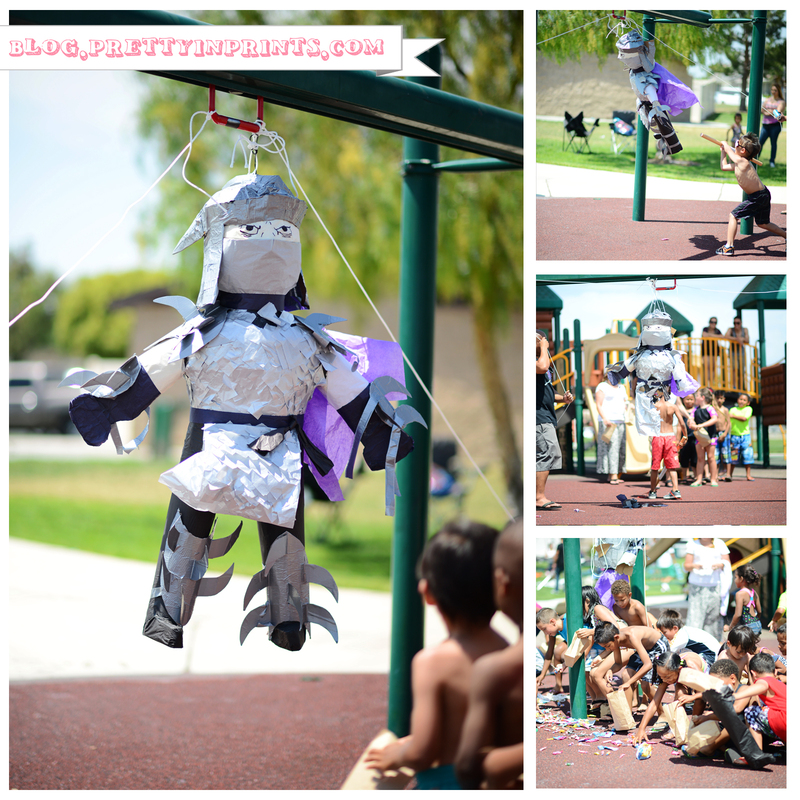 We had a hard time finding a Shredder pinata and when I went to see if I can get a custom one made, they told me it would be too difficult and offered me a Ninja Turtle pinata instead. I knew my son would be disappointed if he had to hit a Ninja Turtle, so what I did was purchase a batman pinata and create my own Shredder. I used a lot of duct tape, cardboard and tissue paper and kind of followed the instructions for a costume found here. 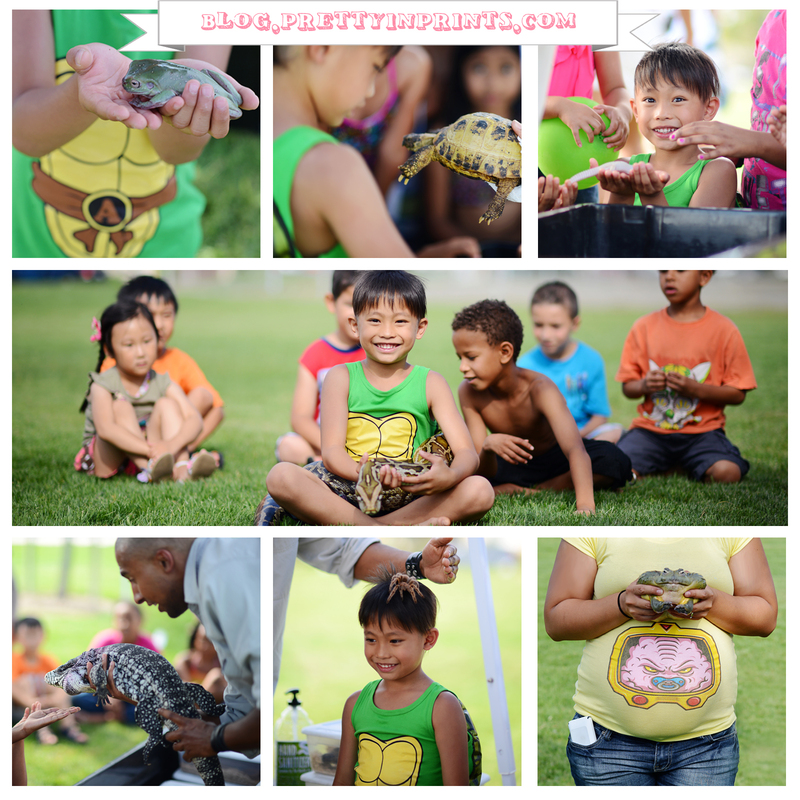 Our final activity for the day was the reptile show that was provided by Jurassic Parties. We learned about all kinds of reptiles and the kids had a chance to touch each one. We were even able to take pictures with our favorite animals at the end! 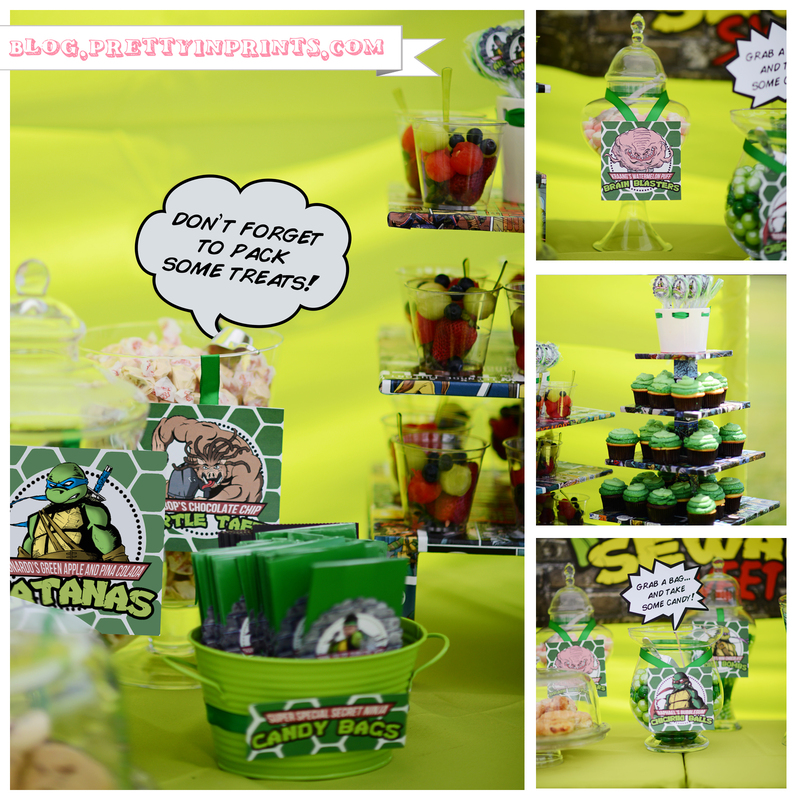 You can purchase the (custom) Ninja Turtle Ultimate Party Pack in my shop. Great Photos! Can you please tell me where you can order the tall cut outs of the TMNT? They are awesome! Hi Heather! We made the cutouts ourselves. I printed vinyl banners using each character, cut them out, traced them onto plywood and used a jigsaw to cut out the shapes. Then I used some heavy duty spray adhesive to attach the vinyl to the wood. I can order you the banners if you want..email me at christine@prettyinprints.com for more info. Love the party! How much did it cost for the vinyl banner project? My little girl would love to have the turtle on her wall in her room. thanks. I really really LOVE the invitation you made! You are awesome! Any tips on how I can do one like that? 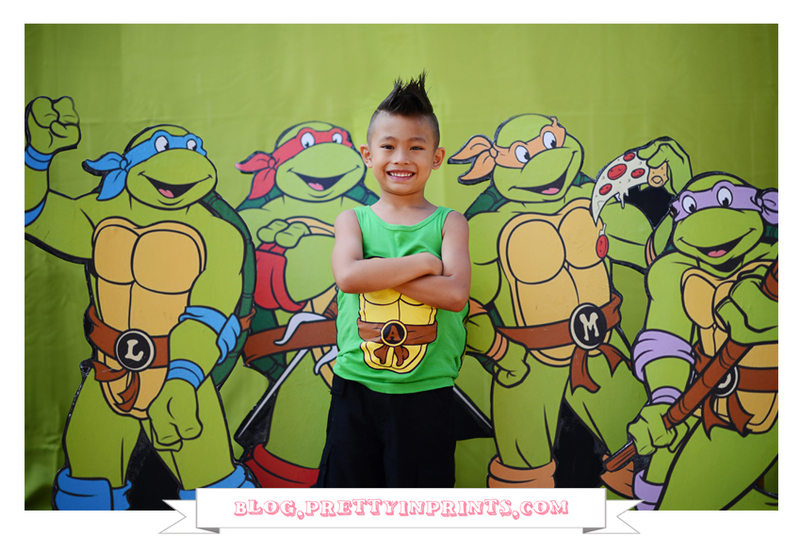 My son is turning 5 and he loves the ninja turtles! His birthday is in December so I have some time go work on a project like that, although I hope it doesn’t take to much time lol. I’d be starting from scratch meaning I have pretty much no idea how to do it.